Supports E-ATX motherboards. Go wild, X99 builders. Bitfenix announced a new flagship computer case today, one that has dual tempered glass side panels to showcase builds that use up to an Extended ATX (E-ATX) motherboard. Onlookers will get a partial view of the case's guts—the main side uses a partially tinted tempered glass panel to "emphasize the premium looks," while a fully tinted panel on the other side means you can still shove cables haphazardly behind the motherboard tray without ruining the aesthetic. Thick aluminum top and bottom panels with curves add to the high-end design Bitfenix is shooting for. They also give the case added strength (compared to cheap plastic). The Shogun can swallow up to half a dozen 3.5-inch hard drives or eight 2.5-inch solid state drives in its drive cage. You can remove or relocate the drive cage to accommodate other components, such as a liquid cooling radiator up to 360mm in size up top and/or up to 280mm in front. There are two additional SSD mounts, both with customizable Chroma lighting to illuminate the drives and area around them. In what seems to be an emerging trend, the Shogun features supports for graphics cards to prevent heavier ones from sagging (three in all). Cooler Master introduced a similar method to support heavy graphics cards in its recently introduced MasterCase Maker 5t. The front I/O panel consists of two USB 3.0 ports, two USB 2.0 ports, and separate headphone and microphone jacks. 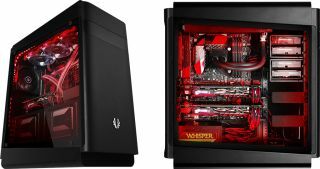 You can purchase the Bitfenix Shogun now; it has an MSRP of $160 can be found for less than $150 through sellers on Amazon.